Foodista | Finally, The BEST bottled cocktails you can buy! Finally, The BEST bottled cocktails you can buy! I would be lying if I told you that I paid much attention to the genre of pre-mixed cocktail. They just haven't been on my radar and probably for good reason. What you can buy here in New Jersey would not be to my taste, nor would I even waste my time looking for them. HOWEVER.... at my door last week, a package arrived from my friend Charles Joly. Charles is, if you don't know- the American Bartender of the year and the James Beard Society Award Winner... That alone made me perk up and say, I'll try what you are working on and I'll let you know what I think. My friends, Crafthouse Cocktails is the best effort that I've tasted to date out of a bottle. 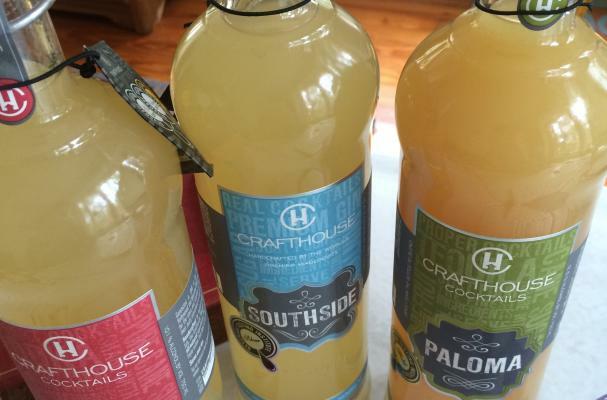 In fact I will go out onto a limb to say that Crafthouse Cocktails in the bottle is still better than 99% of all the bars in Morristown, NJ! They just do it right. I cracked open the handsome flip top on the Paloma. What greeted me was the scent of excellent grapefruit soda, but not your usual flavors. This grapefruit soda appears to have been charred lightly before juicing. It's really gorgeous stuff. The sugar level is just right and the tequila element is not cloying, nor is it rock-gut quality. This is high end stuff that demands your Boston Shaker and salt rimmed glass. The grapefruit is all natural so it separates a bit in the bottle, give it a light shake and all is well. This is the best grapefruit soda by far that I've ever enjoyed. Bravo! And the tequila is lush and rambunctious. I'm suddenly feeling better! The Paloma is made from Blanco Tequila, Grapefruit, Lime, Pure Cane Sugar and "natural flavors".... I'm stunned by its beauty! The Moscow Mule is a delight. From the sparkling peppery goodness of the hand crafted ginger beer to the spices inherent to the mix, this is not your grandpappy's Moscow Mule. This is a most modern interpretation of the classic drink that I've tasted. Again.. Bravo! I'm catapulted to the British Virgin Islands, gripping one too many Moscow Mules while trying to keep a hand on the wheel of the sailing yacht. Something has to give! The label clearly reads, Premium Vodka, Ginger Beer, Lime, Pure Cane Sugar.. Nothing else! I think my favorite of the group is all three, but if I HAD to choose, I'd say the Southside Cocktail would be my favorite for the morning. (because it is morning!) Brimming with the expressive notes of quaility gin, lime, pure cane sugar and natural mint flavoring, if I don't stop tasting these I'm going to have to slow down a bit before the serious work of day drinking begins. These are quite possibly like having Charles at your beck and call, down in your bar- waiting to prepare you these amazing cocktails. The only thing holding you back is your ice. Don't mess it up by using freezer ice from the dispenser. Take the time to boil your water and use good quality 2x2 cubes in the final glass. When you shake your drink it's ok to use the freezer stuff, but not in your glass. You'll ruin this amazing product! Get some just as soon as you can. My second book, Whiskey Cocktails will be out in the coming weeks. You may grab one here!